Want To See Crime In Bothell? There's a Map For That! Have you ever wanted to know where crimes are happening in our fair city? Well, there’s a MAP for that! 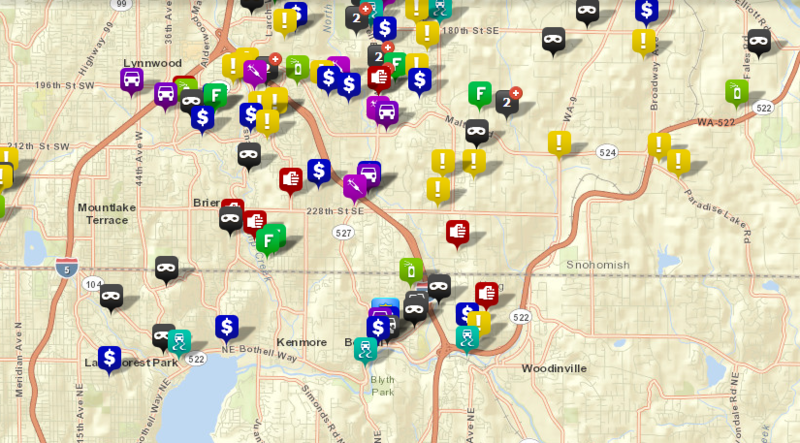 The Bothell Police Department has released a Crime Map that maps out all of the crimes in Bothell (found here: http://www.crimemapping.com/). It works great on my laptop. It didn’t not show up well on my Windows Phone, but it might work better on your iPhone or Android smart phone. In fact, the website mentions that there is an iPhone app, so those iPhone users, I would grab that. There is also data from other police departments including the Snohomish County Sheriff’s department. The website is really well put together. There are different icons for different crimes and when clicked, you get details about the crime such as the date, the type of crime, case number and details about the crime. Anyhow, check it out and see what’s happening in your Bothell Neighborhood. A question I wonder about is the social impact of such transparency. For instance, if someone moving into our area looks at these maps, would that impact their decision to buy a house or move in to a certain area? I bet it would. That would mean bad neighborhoods would get less crime conscious folks moving into them? I don’t know. To me, it is worth the risk. I like being able to know what crime is happening in Bothell. For questions or concerns, please contact Bothell Police Sergeant Ken Seuberlich via his email: [email protected].